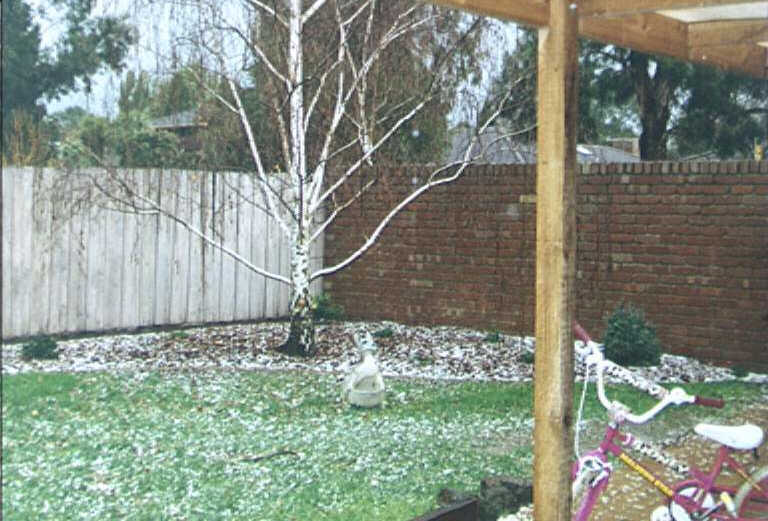 A brief storm occurred in Ferntree Gully, Victoria on the 8th July 1997 when one of the few active fronts of the winter came through. The storm took me a bit by surprise. Showers were predicted on that day but no hail or thunder. The storm developed on a pre frontal trough. Large cumulus and cumulonimbus clouds came in rapidly from the southwest at about 4.00pm. No early rumbles of thunder preceded the storm. At about 4.05pm a very bright flash of lightning followed about one second later by a loud clap of thunder. Hail started failing about a minute later and continued for about another 5 to 6 minutes. The hail was mostly pea sized but a few slightly larger (almost marble sized stones fell). There were several more loud claps of thunder. The storm moved through very quickly and by 4.20pm was moving away to the east over the Dandenongs with a few more distant rumbles of thunder. I recorded 8mm of rain and hail during the storm. No reports of damage were received. The weather after the storm cleared quickly and it was still fairly mild at 6.00pm with a temperature of 10.1. Overnight, much colder air came through. The maximum temperature in Ferntree Gully the next day was just 9.0 and there were several small hail showers as well as brief snow flurries in the Dandenongs. The cold air was still around the following day with the temperature in Ferntree Gully only reaching 9.9 degrees.